KIEV, Ukraine -- The Kremlin has pledged to “defend the interests” of Russian church believers in Ukraine during a growing dispute between rival branches of the country’s Orthodox Church that are loyal to Kiev and Moscow. 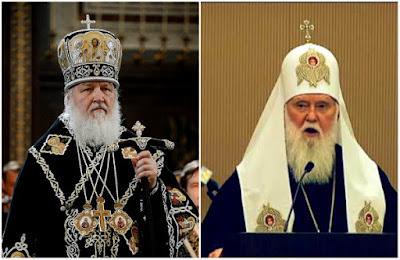 Moscow Patriarch Kirill of the Russian Orthodox Church (L) and Kiev Patriarch Filaret of the Ukrainian Orthodox Church. The warning will alarm Kiev, because Russian president Vladimir Putin justified annexing Crimea in 2014 and supporting Moscow-led militia in eastern Ukraine by the need to defend ethnic Russians and Russian speakers in those areas. Religion is the latest area of conflict between the neighbouring states, as the Kiev Patriarchate of the Ukrainian Orthodox Church has broken with Moscow and secured recognition of its independence from the Ecumenical Patriarchate of Constantinople – traditionally “first among equals” in the Orthodox hierarchy. On Thursday, the Ecumenical Patriarchate in Istanbul announced that a holy synod had agreed that Ukraine should receive a tomos of autocephaly – or decree of independence – 332 years after Constantinople gave Moscow jurisdiction over Kiev in church affairs. Historic monasteries The Kiev Patriarchate now plans to hold a special council with the small Ukrainian Autocephalous Orthodox Church and willing archbishops from the Moscow Patriarchate to form a united Ukrainian church, which could formally receive the tomos as soon as next month. The Russian church is furious over the issue, however, and warns that it will split the Orthodox world, end the primacy of the Ecumenical Patriarchate and trigger violence in Ukraine over possession of its historic monasteries. “If the developing events lead to illegal actions, then of course, just as Russia defends the interests of ethnic Russians and Russian-speakers everywhere, so here . . . Russia defends the interests of Orthodox believers,” Kremlin spokesman Dmitry Peskov said on Friday. “This is an absolutely justified and understandable position,” he added, while insisting that Moscow would use “only political-diplomatic” methods in any response. “We know about the tough and logical reaction of the Russian Orthodox Church to decisions announced yesterday from Constantinople,” Mr Peskov continued. Alexander Volkov, a spokesman for Patriarch Kirill of the Russian Orthodox Church, accused the Constantinople Patriarchate of “crossing a red line . . . catastrophically undermining the unity of global Orthodoxy” and “brazenly and aggressively” interfering in its affairs. Ukrainian church independence would be a blow to Mr Putin – who has restored power and prestige to the Russian Orthodox Church – and critics of the Constantinople Patriarchate accuse it of acting on US orders to weaken Moscow’s influence. Ukrainian president Petro Poroshenko said the creation of an independent national church in his country would represent “a victory for good over evil, light over darkness”. On Friday, the Kiev Patriarchate announced preparations for a council to unify the Ukrainian church and prepare for independence, which it said could be granted in the second half of November; the Moscow Patriarchate said it would not attend. The Kiev church said unification should happen “voluntarily, peacefully and without coercion”, and Ukrainian interior minister Arsen Avakov warned that “if there is a need to counter extremism and religious hatred, we will act forcefully”. Here we go again. Is this another Crimea in the making?